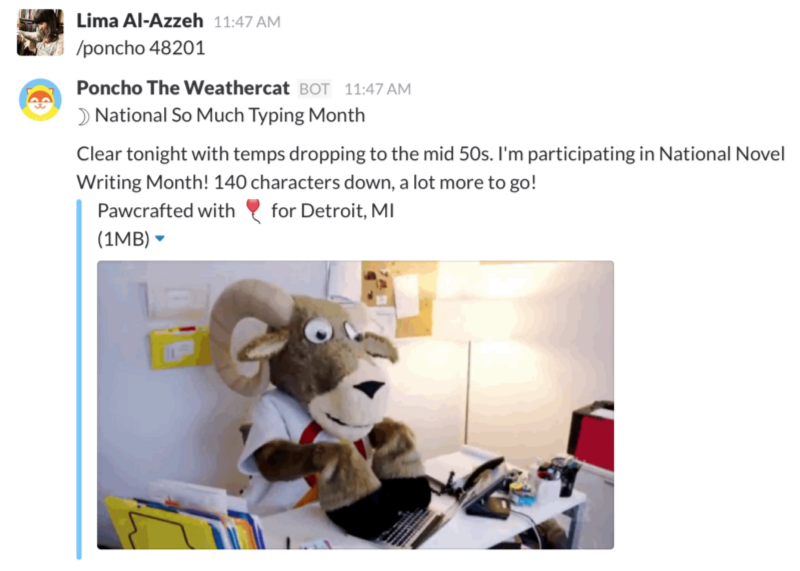 A couple months ago, we debuted the Add to Slack button, which allowed users to more easily receive alerts, reminders, and notifications inside of Slack. Gone were the days of complicated configurations within Slack’s admin controls, going forward you could simply hit the Add to Slack button to connect your team to a growing number of apps. It was great, but it was only the first step to improving the Slack Platform. Today we’re announcing Slash Commands that are just as easy to install, using the same Add to Slack button. For outside apps and services that have written code to talk to our new API, you just click a button to add it to your own Slack team. There’s also new functionality in Slash Commands: they can post both privately and publicly into channels along with improved formatting. Once you’ve installed a new Slash Command, type a Slack message and a variety of custom output will display in your channels. We’ve done behind-the-scenes work to make it easy to do all the things you can do with a given 3rd party application, with the easiest possible installation. Here are a few examples of the new Slash Commands launching today. With Lyft’s Slash Command installed, among other things you can check how long it’d take to get a car at any address, what the estimated cost between two addresses would be, as well as request a car to your saved home and work addresses, right inside of Slack. Imagine getting a ride home after work by simply typing /lyft gohome and waiting for it to show up. You can also try /lyft eta to get updates on how close the car is to arriving. Sound interesting and useful? Lyft’s blog has more details about how it all works. Foursquare has information about millions of nearby places — those are now at your fingertips, inside of Slack. 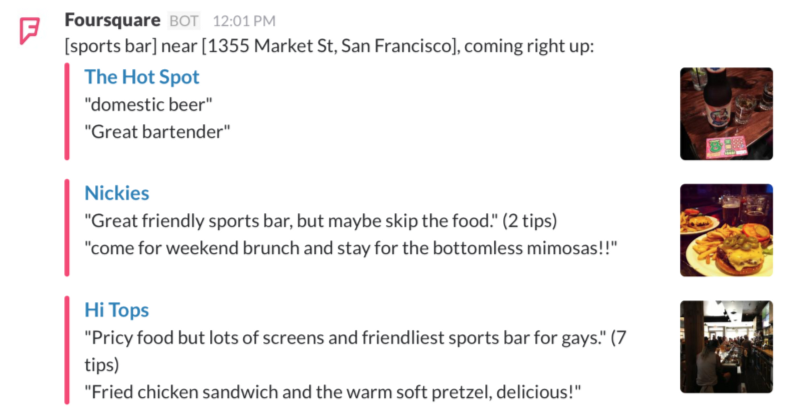 Wondering where to get lunch with your team? To find something nearby just type /foursquare lunch near 1600 Pennsylvania Ave, Washington, DC and Foursquare will post their three best suggestions to your channel. It’ll work not just on restaurants; use it to find electronics stores, the best parks, and places to swim near any address on earth. You can install this for your own team at Foursquare. Dribbble is the design site where the question “what are you working on today?” is answered thousands of times each day by artists showing their work. 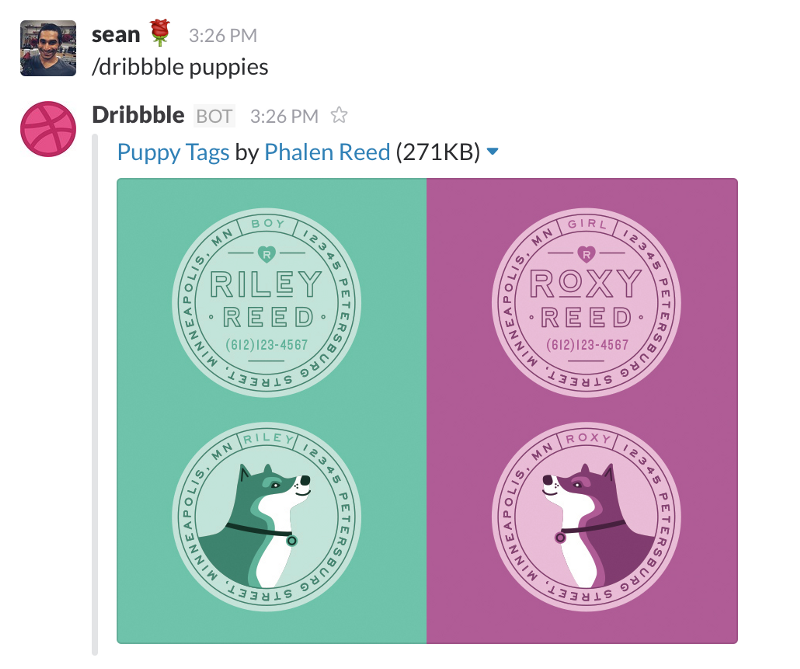 With Dribbble’s Slash Command enabled on your team, you can bring up images according to any keyword, similar to how the Giphy integration works. Typing /dribble [any keyword] will show a response like the one below. More information and installation details can be found on Dribbble’s site as well. There are more Slash Command apps launching today, including Poncho (delightful weather predictions by zipcode) and Blockspring (an impressive middleware app that can talk to other APIs, offering up a swiss army knife-full of new options). These are just the start, with many more offerings to come. Respond up to 5 times to a command, up to a half hour after the initial command. This is useful when services want to do more than just provide a single, immediate response. Control the icon, name, and formatting of your responses so they look and feel like an extension of your product or service. Add photo and text attachments to your responses. Install Slash Command apps along with incoming webhooks and any of our new granular OAuth scopes. For anyone with a popular internet service or app, check out our updated API documentation and start writing more powerful apps for Slack that are a simple one-click install away.